If you were to stop 10 people on the street and ask them what they thought was the dirtiest place they could think of, at least 8 would mention a public toilet seat. I’m sure you too, at home, were thinking the same thing. Would it surprise you, to know that a recent study revealed that our cars are at least twice as dirty as a public toilet? Surprised? I was too. The study, conducted by microbiologists in the U.K. on a sample of 25 cars, showed that the steering wheel of an average vehicle is home to over 700 types of bacteria. Compare that to the 60 types found on an average public toilet seat, and the results start to get frightening. Now, if that wasn’t enough to get you thinking twice before entering a car, another study carried out by the University of Birmingham revealed that baby car seats too (often considered the cleanest items in a vehicle), harbored nearly twice as many bacteria as those on a public toilet seat, at 100 different types. Considering how often many of us regularly eat in our cars, these studies are eye-opening. Not only are the objects in the car cabin littered with bacteria, the air too is infected, and without proper ventilation, these bacteria can and will get into your body through the lungs and the stomach. This problem is especially prevalent here in the UAE, where the hot temperature and stagnant air are ideal for those little critters to breed and multiply. As mentioned earlier, the temperature conditions here in the UAE are ideal for bacterial growth, so make sure you roll down your windows and let the air flow for at least a good 5 minutes, before you turn on the air conditioning. Take out the mats and carpets from your car, and make sure you vacuum away any dust or food particles you can get your eyes on. Food, no matter how small in size, will decay as it grows old. When remains inside a hot car in the sun, the bacteria grows fast. Make sure you have a can of air freshener ready to go any time you enter the car. Not only is it great for disinfecting the air, it also helps the cabin smell great. Get the air filter changed and the AC vents cleaned out as often as you can. Dust tends to accumulate inside the vents, and is later thrown out into the cabin anytime the fan is turned on. It goes without saying, but major cause of bacteria in the car is the leftover food, or your contact with the surfaces. While it’s not possible all the time, it is recommended that you avoid eating in the car. Should you find yourself ordering take away from McDonald’s, stop the car at a safe place and step outside to enjoy your meal. Also remember to throw away any wrappers or bags! It is also recommended to try out different disinfectants on the upholstery of your car’s cabin. 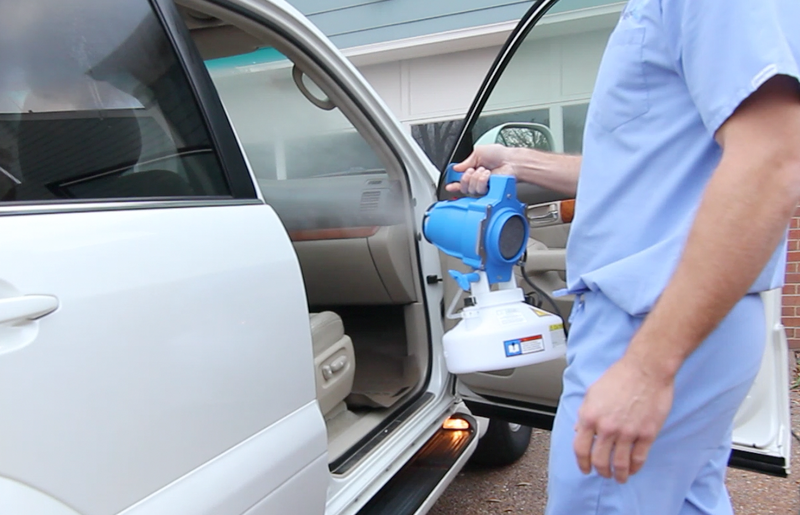 As seen here, these products can be very effective to kill germs in your car. There are of course various other ways to kill germs in your car, but these are the six most highly recommended. If you have other tips you’d like to share with us, leave them in the comments below. How to Clean your Car Interior?